This is a guest post by Kathleen Alcalá—she interviewed Donna Miscolta for Intermittent Visitors. 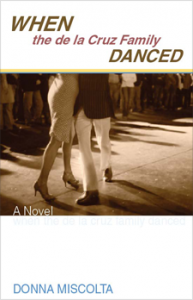 Donna Miscolta’s first book is the novel When the de la Cruz Family Danced, published by Signal 8 Press in June 2011. Her short story collection Natalie Wood’s Fake Puerto Rican Accent was a runner-up for the 2012 Flannery O’Connor Short Fiction Award and a finalist for the 2010 Grace Paley Prize for Short Fiction. 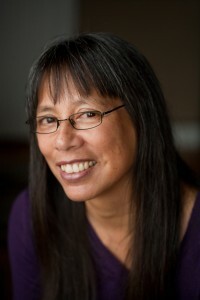 Her work has appeared in America’s Review, Calyx, Cha: An Asian Literary Review, Connecticut Review, Conversations Across Borders, Kartika Review, New Millennium Writings, Raven Chronicles, and others. She has been awarded residencies from Anderson Center, Atlantic Center for the Arts, Hedgebrook, and Virginia Center for the Creative Arts. She has received numerous grants and awards, including an Artist Trust Fellowship and the Bread Loaf/Rona Jaffe Scholarship for Fiction. 1) Your first book was published last year. Tell me what it is about. Thematically, When the de la Cruz Family Danced is about assimilation and belonging. Story-wise, it’s about a family needing to overcome the psychic distances that separate them – a dysfunction that has its origins in the suppressed sense of estrangement the father, Johnny de la Cruz, feels from his Filipino homeland. The emotional vacuum within the family is suddenly filled by a young man named Winston, the son of an old flame of Johnny’s. Winston presents himself at the de la Cruz family doorstep, armed with his recently deceased mother’s letter that alludes to a one-time intimacy between her and Johnny de la Cruz. Winston is handsome, charming and, with the death of his mother, suddenly adrift and seeking attachment. While keeping the letter a secret, he gradually weaves himself into the thin emotional fabric of the de la Cruz family. Winston’s ability to command a dance floor, swim with dolphin ease, and juggle like a magician seems to elevate the de la Cruz family above their average skills practiced self-consciously in a less than middling neighborhood. But things start to unravel with Winston’s decision to reveal the letter to Johnny and are complicated further when the letter disappears. In the meantime, the family suffers a loss that forces them to act on unresolved anger over past failings and uncertainty about Winston’s role in their lives. More information plus reviews can be found on my website and on Amazon.com. 2) Did the experience go as expected? There was so much I didn’t know and understand about the publishing business. I knew writers who’d been published and I had attended workshops and panels on the publishing process. And yet, I was still under the quaint notion that being published was a fairly straightforward matter and that my book would suddenly appear in bookstores across the country. I didn’t understand how a book is distributed and under what conditions. I knew that as an author with a small press, much of the promotion of the book was up to me, so I did spend a lot of time seeking out reviewers and book bloggers. I was happy with the results of my efforts in that regard. But booking readings in bookstores was a huge challenge and except for a few places locally, my inquiries were politely refused, brusquely declined, or altogether ignored. I’m so grateful to the stores that did embrace and support me. And I owe a lot to fellow writers who helped arrange for appearances with student groups on college campuses and at special events, and who helped connect me with book groups and readers in general. I belong to a very generous and gracious writing community. 3) As I recall, your book was published with an international audience in mind. Who did you expect your audience to be, and who have you found your audience to be? Yes, my publisher, based in Hong Kong, focuses on books of relevance to Asia and the Pacific Rim. I did want to reach an Asian and Asian-American audience. I’m not sure how widely I’ve reached the former, but I have received feedback from Filipino-American readers who have described how deeply they had connected with the story and the characters. Cha: An Asian Literary Journal, which receives the credit for my book finding its way to my publisher, included a review of When the de la Cruz Family Danced in one of its issues. The review was written by Dinah Roma Sianturi, a Filipina writer and scholar at a university in Manila. I absolutely loved her review. I also wanted to have readers beyond the Filipino community and if I were to hazard a guess, I would say that most people who have read my book are outside of this community. The story appeals across ethnic lines as many of those who have reviewed the book have pointed out. This is important to me because as proud as I am of my Filipina and Mexican background (which my characters happen to reflect), my stories, like so many stories, are about the fallibilities and longings that are part of being human. 4) You made a wonderful trailer to go with the book. Tell me about that. I was considering as many angles as I could that were feasible for me to pursue in terms of ways to promote the book. One of these was a book trailer. I will say I did some research on the effectiveness of book trailers in selling books, and from what I could glean, it seemed that book trailers had little or no impact on book sales. And yet, the idea of a video was so appealing, largely because I saw my novel as a very visual one. Despite evidence to the contrary, I hoped that a trailer could be an enticement for someone to read my novel, and if it wasn’t, well, I would still have a lovely video out in the world that would in itself give pleasure. Because dance is in the title of the novel and dance appears a number of times throughout the book, I knew I wanted the video to feature dancers. I hired the wonderful dancer Vanessa Villalobos who in turn procured three additional dancers to dance the bolero. To give a sense of the story, I selected a passage from the novel for the voice-over narration that I felt encapsulated it. As an alumna of Hedgebrook, the writer’s retreat for women, I have had the good fortune to meet many talented women, among them the writer Ann Hedreen who with her husband Rus Thompson also makes films through their company White Noise. Ann’s enthusiasm and support for my ideas and Rus’ superb direction, camera work, and editing skills resulted in a beautiful book trailer that I never get tired of watching. 5) You are working on another book. Tell me about it. My novel-in-progress, The Education of Angie Rubio, deals with issues of race, identity and family. These are issues that I’m naturally preoccupied with and that reflect who I am as a writer and why I write. I created Angie Rubio when I began to think about how a child learns to view herself, the world around her and her place in it. I wanted to place this self-discovery within the world of education – kindergarten through grade twelve. Each of these grades is marked by some developmental or social milestone, the achievement or failure of which is bound to affect the spirit and soul in some way. The events in the novel show that what we learn, how we learn and how we behave is shaped by where the power lies within a relationship or situation. 6) Will you do anything differently in publishing and promoting your next book? I expect my next book will also be a small press product. Ready and waiting for publication is my collection of short stories. Even though it was a runner-up for the 2012 Flannery O’Connor Award for Short Fiction and a finalist for the 2010 Grace Paley Prize for Short Fiction, the common understanding is that a large publisher will not consider a book of short fiction unless the author is famous or has had work published in major magazines such as The Atlantic or The New Yorker. So I’ve been submitting to more contests and querying small presses. If and when the manuscript gets picked up by a press, I’ll be better informed about pathways to distribution and how they affect access to bookstores. I’ll seek reading opportunities beyond bookstores and I’ll expand the list of book reviewers and book bloggers I developed for my first book. I would hope that readers of my first book will welcome and embrace my second. What I learned from the often uncomfortable process of promoting your own book is that even though you will feel disheartened by the unresponsiveness of the book business people because you are an unknown, even though you are frustrated because your book won’t be acquired under the conditions set by a bookstore, even though you will not have the resources to mount a big or even a modest promotional campaign, your book will find its way into some readers’ hands and some of those readers will find you and tell you they love it, and it will make your day. This was written by joannemerriam. Posted on Sunday, October 28, 2012, at 12:12 pm. Filed under Um... yeah. Bookmark the permalink. Follow comments here with the RSS feed. Both comments and trackbacks are currently closed. Hi, Donna and Kathleen. Great interview. I just wanted to add that, since you have a book under your belt, you should seek an agent now. Best of luck!